Site Of The Now: MiniOrgan – Rockabye Baby! If you're anything like me, you grew up in the era where the synthesizer transformed from a super-expensive piece of musical equipment played by 70s prog rock beardoes into an affordable home music-maker due to the onward march of technological progress. If you're nostalgic for those times, the MiniOrgan Library will be just what the doctor ordered. Over one hundred toy organs and synthesizers are featured, along with sound samples of notable models. It's an awesome trip down memory lane and will make you want to hit up eBay for some of these cool gadgets. Thank you for finding this site. In particular, I found MY MINIORGAN! 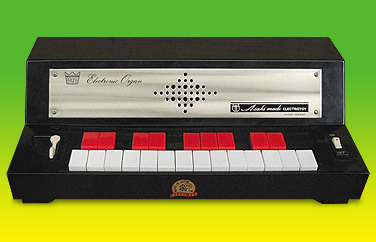 I had the GE Tote-A-Tune organ back in 1971 (“Yes I know, I was no longer a child by then, but this instrument was soooo much more than a ‘toy’!”) It was my 2nd synthesizer (my first being a set of walkie-talkies that I rewired to play all sorts of wave sines every time you touched the exposed circuit boards with the covers removed!) and it was my favorite! I got some incredible tones and sounds from such a small device. (The scores it received from the website were totally justified!) I only wish I still had mine. Thanks for the memories! How cool is that? A trip down musical memory lane.